In-unit washers and dryers add to the expense of building and development. Common laundry facilities experience more wear and tear and become a consistent maintenance demand. Vent outputs for traditional dryers have to be installed and maintained. Now, thanks to the transformative technology of ventless dryers, which can comfortably fit inside each unit of a multifamily building, builders and designers have a much more attractive option. Ventless dryers can help save time and money in the design and construction of a multifamily building as well as some single-family homes. They also improve aesthetics, since laundry appliances can be more easily integrated within the living space. Ventless dryers have been popular in Europe and Asia for many years, and are becoming more common in the United States for a variety of reasons. Ventless dryers not only offer the performance of traditional laundry without needing external vents or high-capacity plumbing, but provide space and flexibility that helps make construction projects more efficient and profitable. 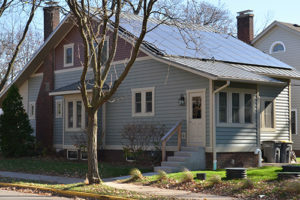 As sustainable housing becomes an increasingly desirable option for residents across the country – possibly to meet goals set by state or local municipalities – it will be necessary for builders and remodelers to install appliances that make limiting water and energy usage more feasible. Builders can save overhead cost per unit, on average, in multifamily buildings if they don’t have to install dryer vents. They can also save on the cost of maintaining and cleaning vents. Environmentally friendly home attributes are particularly a priority for Millennial homebuyers. 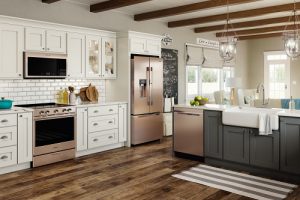 A survey by Ketchum found that 62 percent of Millennials ranked environmentally friendly features somewhat or very important to their homes. Laundry appliances are a significant part of this equation. Ventless dryers provide more drying options, including lower heat settings. 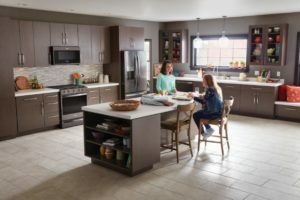 Select Whirlpool® ventless dryers and paired washers also meet the sustainability standards announced by the Association of Home Appliance Manufacturers. From a designer perspective, ventless dryers provide more locations to store laundry appliances within a single or multifamily residency and eliminate the need for a traditional laundry room. For example, the 2.8 cu. 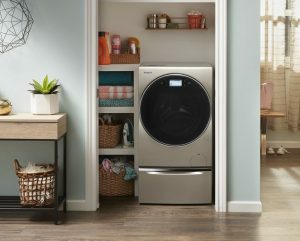 ft. Whirlpool® Smart All-In-One Care™ Washer and Dryer will fit in a variety of places including closets, laundry rooms and bathrooms for those with limited space. The easy compatibility with various living areas greatly expands design opportunities for builders and remodelers as well. Whirlpool® ventless dryers only require a power outlet, making it possible to easily turn unused space in a residency into a laundry area. No additional space is required behind the dryer. This particularly can be beneficial for remodelers who need to find space for laundry facilities. Also, ventless dryers are a practical solution for older buildings where remodeling may not be an option or high occupancy buildings in which installing ventilation may be excessively costly. In the U.S., federal and state organizations recognize that clothes dryers have historically not been subject to scrutiny to the extent of dishwashers, clothes washers, refrigerators and other appliances. As clothes dryers become subject to more rigid energy performance standards, ventless technology will be a simple and sustainable means of transitioning to meet new expectations and regulations. Additionally, more builders and manufacturers are striving to provide conscientious homebuyers with zero net energy homes. In such accommodations, every Kilowatt Hour counts. Ventless dryers are one appliance that help make the ubiquity of zero net energy residencies a more realistic future.